Bachelor Party is simply incomplete without a party bus. In the event that you are planning to go at a bachelor gathering with style and luxury then you must consider this transport. Party buses accompany the most progressive features in it like extensive plasma TV, bars, strobe and neon lights, mist machines and fascinating sound equipments. EWR NJ Limo is the most famed provider of bachelor party buses that are safe and affordable to reach and rock Bachelor parties in and around NJ. Our stretched party buses in NJ can hold up to 28 passengers. 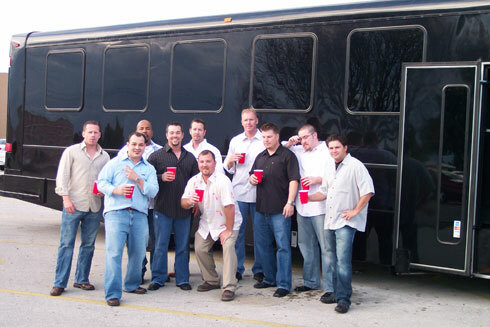 Large space and amazing interior design is what makes our fleet perfect for bachelor parties. Our entertainment system is loud and bright enough to keep the party going for long whilst travelling from one place to another. We make sure that your fun will never stop from dance and drinks to the club. As customer safety is our prime concern, we have trained chauffeured driver who will get you securely to your desired destination. The bachelor party buses we provide are finely geared with features which make you comfortable to select the suitable one for various party and occasions. Not certain what will the best place to party and enjoy the night in NJ? Don’t take stress anymore! Our experienced party bus chauffeurs have an abundance of information related to where to gather or eat and how to ride like a VIP. If you want to go to an exotic gambling club then, we can refer you to gambling clubs to give you exceptional clubhouse advancements. Call us for points of interest. © 2019 EWR NJ Limo. All rights reserved.